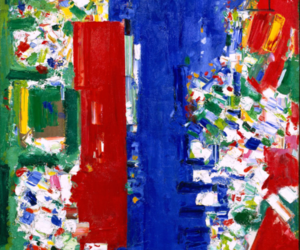 The exhibition Creation in Form and Color: Hans Hofmann is a collaborative project by the Berkeley Art Museum, the Pacific Film Archive at the University of California (BAMPFA), and the Kunsthalle Bielefeld. It is based on a precise selection of approximately 60 paintings, watercolors, and drawings that span the artist’s entire career from the 1920s to the early 1960s. 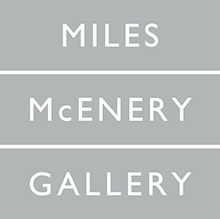 The show includes works on loan from the Berkeley Art Museum, as well as from prominent American and European museums and private collections. One of the exhibit’s particular goals is to examine Hans Hofmann before the backdrop of his European tradition in his role as an important artist and teacher of 20th century American modernism. Additionally, the show weighs his exploration of his experiences and influences in his chosen homeland of America, while simultaneously emphasizing his theories and work, which made him an especially significant artistic mediator between the continents. Despite his fundamental importance to the development of modern art in America—where prominent exhibitions were devoted to him during his lifetime—Hofmann remains less well known in Germany and Europe as a member of the Modernist avant-garde. On the second floor, the Kunsthalle Bielefeld’s collection of American art complements the rest of the show. Our collection consists of prominent paintings, sculptures, and prints, and this is the first time that so much of it will be on display at once. Hans Hofmann was born in 1880 in Weissenburg, Bavaria, and died in the United States in 1966. After studying art in Munich, he moved to Paris in 1904, where he lived until 1914. In the European art capital Hofmann became deeply acquainted with the revolutionary new developments in painting. His circle of friends included Picasso, Braque, Matisse, the Fauves, and Robert and Sonia Delaunay. Cézanne’s work was a substantial influence on Hofmann, and the Cézanne retrospective in 1907 in Paris made an indissoluble impression on him. When World War I began, Hofmann was forced to leave Paris; he opened his first art school in Munich, where he taught European modernism. His school soon drew international attention, attracting young artists from all over the world. At the invitation of some of his former American students, who had begun careers in the art world at home, Hofmann journeyed to the United States in 1930 and 1931 to conduct lectures. Due to the political developments in Germany, he eventually decided to re-open his school in New York City. As he taught modern, European-influenced theories of painting, Hofmann became one of the most influential teachers of a new generation of artists in the United States, many of whom went on to leave their mark on the New York School of Abstract Expressionism. Artists such as Jackson Pollock, Lee Krasner, and Helen Frankenthaler were decisively influenced by Hofmann’s theories and work. Despite his great success as a teacher, Hofmann primarily considered himself a painter, and from 1958 onward he devoted himself solely to painting. In his own work he pursued and developed the concept of the autonomous image. His paintings examine themes such as the individual validity of painting as a method and the autonomy of the intellectual creation. Even though many of his paintings seem abstract at first glance, they always maintain a connection to nature. In pursuing his own ideas, the artist created an entirely autonomous body of work from out of the perceptions and experiences that resulted from his own observations of nature. This work did not depend upon external tasks, such as the illustration or reproduction of a motif. Hofmann’s great passion was for color. In a 1955 essay, he wrote: “In nature, light creates color; in the painting, color creates light.” In one of his principles, which he called “push and pull,” areas of strong color push into the foreground of dynamic surfaces made up of overlapping shapes, while others retreat into the background. The exhibition is supported by the Renate, Hans, and Maria Hofmann Trust and the Stiftung der Sparkasse Bielefeld. The exhibition catalogue is being published by the Hirmer Verlag.